I LOVE these! 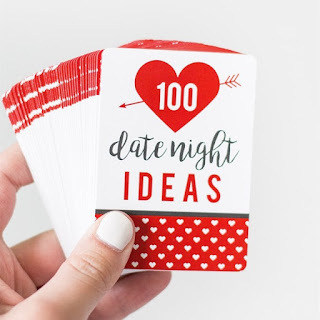 Check out 100 Date Night Idea Cards for $12.99 (Retail $19.99). Whether you are just getting to know someone or enjoy a committed relationship, these idea cards will bring some spark and excitement to your date night. You can choose to use them in sequence, select cards at random or plan ahead. Any way you choose to use them, your relationship will strengthen just by spending time together. Each card has a unique idea that ranges from watching funny YouTube videos together, playing a 1-on-1 game of basketball, learning a new skill or cooking a meal together. In any way you choose to use them, your relationship will strengthen just by spending time together. Making the commitment to have a date night will always result in this statement: "we should do this more often." These cards will help you do just that. Remove distractions, focus on "us" and remember why you make such a great couple! Each deck of Date Night Cards contains 50 double-sided cards stored in a crystal clear, durable slider box. These boxes are top-quality and will hold up through years of fun dates.